When the original Tiger Woods Wii PGA Tour golf game was released in 2007, a lot of people realised just how much potential there was for the Wii remote controller, and just how different golf video games of the future would be. Even though the first Tiger Woods game on the Wii didn't quite get all the controls right, each new edition of the game has been better and better. This year is no different, and with the new Wii MotionPlus adapter, Tiger Woods PGA Tour 10 sits proudly at the top of the leaderboard as the best Wii golf game to date. The Tiger Woods Wii golf games are getting closer and closer to simulating real golf, and with the new Wii MotionPlus adapter, Tiger Woods PGA Tour 10 really does feel like you're playing a real round (without the long walk of course). With a superb career mode that includes Major tournaments and the new FedEx Cup, great online play, an in-depth character customisation tool, the ability to tune your clubs to match your playing style, a load of fun mini-games for the whole family, and 27 different championship courses to play, this game has more gameplay than you can shake a (golf) stick at! The short answer to this question is everything! The publishers of the Tiger Woods golf video games series, Electronic Arts, have really upped their game with all their sports titles over the last 2 or 3 years. Tiger Woods Golf, FIFA Soccer, Madden NFL Football, NHL Ice Hockey and Fight Night Boxing have all received critical acclaim for their high quality gameplay and for getting ever closer to simulating the real sporting experience. I'm going to go out on a limb here and say that this year's version of Tiger Woods Wii PGA Tour golf is the best sports game of them all. Most of this year's other sports titles are still to be released, so this title may be short lived. Until then though, it sticks. The Wii remote controller has already proved how fun sports games can be on the Wii. In previous Tiger Woods games, as well as other Wii golf games, swinging the Wii remote like a golf club has given players a sense of what it's like to play real golf. As fun as the game play has been though, the more subtle aspects of the game have been a little hit and miss. Adjusting your swing to get the right swing power levels when hitting delicate approach shots and putts was almost impossible to achieve consistently, and it took some of the fun out of the game knowing that some shots were totally out of your control. With the new Wii MotionPlus adapter in Tiger Woods Wii 10 though, trying to guess how high and how fast to swing the controller is a thing of the past. 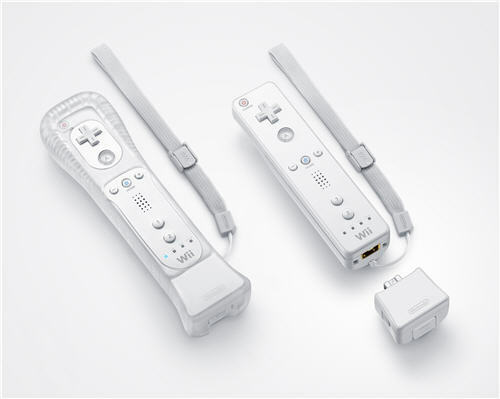 The MotionPlus adapter has just been released by Nintendo and improves the accuracy of the Wii remote controller's movements when playing compatible games. With the Wii MotionPlus adapter in Tiger Woods PGA Tour 10, your golf swing on the screen now matches the swing you're making with your Wii remote controller almost exactly. During a round, you'll often have to hit the ball with less than 100% power to compensate for wind and other conditions, and swinging with just the right amount of power was always difficult to judge with the plain Wii remote. In the new game though, and using the Wii MotionPlus adapter, swinging the controller back to just the right height and with the right speed, to create the perfect shot, is now much easier to get right. The graphics are another stand out feature of Tiger Woods Wii 10. All of the golf courses and backdrop scenery are highly detailed, and this really creates a different golfing experience with every round. The detail around the greens is also superb, and you can easily make out the slopes and angles of the greens when playing short approach shots. This takes out the guess work of where to land your short chip shots, as you can work out which way the ball will roll on the green. Perhaps the most amazing feature of this Tiger Woods golf game though, is the amount of gameplay you'll get. All of golf's competitive formats are here, including stroke play, match play, skins, better ball, stableford, and more. No matter what type of golf you like, you'll find it in this game. The two main modes in the game are Career and Quick Play modes, with Quick Play mode letting you jump right into a round with minimum fuss. Simply choose the type of round or format you want to play, the number of players, and your golf characters, and you're ready to tee off! Most sports games these days have a Career mode, where you start life as a young amateur and earn improved skills as you play through the game trying to become the best player in the world. Tiger Woods Wii 10 is no different and the Career mode here is as good as any other game. When starting Career mode, you'll begin by customising your in-game character so you can take your place with the world's best. The game has a highly detailed character customisation tool that lets you choose everything from the shape and size of your head, eyes and mouth, to the style and colour of your moustache (or ponytail if you choose a female golfer). You can spend as much or as little time as you like with the tool, opting to go for the default character or creating your very own Frankenstein. After creating your in-game golfer and choosing some golf threads, it's off to the practice range to fine tune your clubs. Everyone has a different way of swinging the Wii remote controller, and Tiger Woods Wii 10 lets you tune your clubs to compensate for your own personal swing. This Club Tuner feature helps to improve your hitting accuracy in the game, and works really well. As a golfer who likes to hit the cover off the ball, the Club Tuner screen allowed me to compensate for the ugly draw that creeps into my game. You'll start Career mode as an amateur golfer with a small amount of skill points in each golf skill category, like power, accuracy, putting and ball spin. You'll earn additional skill points in each category by playing through the PGA Tour, Major tournaments and the new FedEx Cup competition. A great feature is the option to choose how long you want each tournament to run (anywhere from 1 round per tournament to a full 4 rounds), so you can shorten Career mode to fit into your time schedule if you need to. Online play in Tiger Woods Wii 10 is another feature worth writing home about. In addition to playing a round or two against other players from around the world, perhaps the most exciting feature is the online tournament mode. Every week Electronic Arts sets up tournaments that are free to enter. You can choose tournaments that are only one round, or up to a full four rounds long. In these online tournaments you'll play through the round on your own, and your final score is then added to the tournament leaderboard. This is a great way to compete against other players without having to wait for all of them to play their shots before getting your turn. The game even has online versions of actual live tournaments as they happen on the PGA Tour. As you complete your online round, your score is put up against the real scores that the Pros are shooting out on the course. Online games are easy to get into and gameplay is lag free and smooth. Unfortunately tournaments don't run every day but there is a tournament calendar you can view when you go online, so you can see when tournaments are due to kick off. Don't worry if you've never played golf or golf video games properly before because Tiger Woods Wii PGA Tour 10 does a great job catering to different skill levels. Nobody would argue that golf is a highly skilled game, and this might easily turn off non-golfers looking at buying Tiger Woods golf. The game has 3 different skill levels, with the easiest level called "All Play". In the spirit of golf's handicapping system, which lets weaker golfers compete against more skilled golfers in a real round of golf, players playing against each other in Tiger Woods Wii 10 can each have their own difficulty settings during the same round. This lets one player have the "All Play" setting, while a more skilled player has a more advanced setting. This makes the game competitive regardless of who plays together, and makes the game highly accessible for all ages. When you're looking for something a little different after a few tough rounds, Tiger Woods Wii 10 has a Golf Party mode. Golf Party is a collection of mini-games that are challenging, but fun to play with friends and family when you don't have the time or inclination for a full round. There are 15 mini-games in total, and include ball juggling, speed golf, mini-putt, closest to the pin, and target. The game also comes with an additional game mode called Disc Golf. Disc Golf is played on a regular golf course, but instead of hitting a golf ball, you have to throw a disc towards the hole. Disc Golf isn't a replacement for the real thing, but it's a simpler game that the whole family can play. Throwing the disc is much easier than swinging the golf clubs, and uses a simple throwing motion with the Wii remote controller. If you don't have a Wii MotionPlus adapter, you'll need to buy this either separately or bundled with Tiger Woods Wii PGA Tour 10 at an additional cost. The adapter is very small and plugs into the bottom of your existing Wii remote controller. The list of features in the game is so long that I didn't even mention the 27 different courses; including the venues of the 2009 US Open at Beth Page State Park, the 2009 British Open at Turnberry, St. Andrews, Wentworth, the Gary Player course at Sun City, Pebble Beach, and many, many more.